Chili Peppers 'Bishop's crown' (Capsicum baccatum var. pendulum): growing, planting, caring. 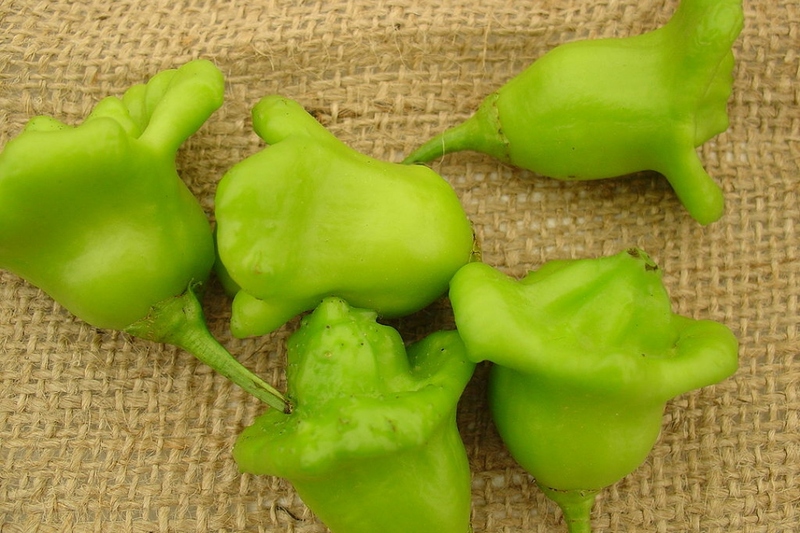 The bishop's crown - Christmas bell or joker's hat - is a cultivar of the species Capsicum baccatum var. pendulum, named for its distinct three-sided shape resembling a bishop's crown. Naturally found in Barbados and South America, it is also grown in Europe and elsewhere. The plant is relatively large, being three to four feet (0.8 - 1.2 meters) in height, and produces 30 to 50 peculiar, three or four flat-winged, wrinkled pods, maturing to red from a pale green colour about 90-100 days after the seedlings emerge. The body of the peppers have very little heat, with the wings being sweet and mild.